(NaturalNews) By their own admission, the gay community is most often associated with passivity. Aggression isn't in their nature. But then again, neither is a penchant for victimhood, which explains a growing "subculture" within the gay and lesbian communities: Guns. With taglines like "pick on someone your own caliber," and "armed gays don't get bashed," [Gwendolyn] Patton [of the group Pink Pistols] says [her organization] changes the perception that gay people are easy victims. "We teach queers to shoot, and then we teach the rest of the world we've done it," Patton told WBEZ 91.5, a public radio station in Chicago. "Because then they may think twice about using (LGBT people) as a target." Illinois Libertarian activist Doug Krick, founder of the Pink Pistols in July 2000 while living in Massachusetts, has seen it grow to 60 chapters in 33 states and three countries, Edge reported. Among the groups' activities: visiting firing ranges; political activism, including the production of report cards on politicians' positions; and rating politicians on issues of interest to group members. There isn't much else known about Pink Pistols, including the number of members nationally because the organization doesn't collect membership figures. Some may dismiss the group over the makeup of its membership, but that's a mistake - especially for anyone who is serious about upholding the Second Amendment rights of all Americans, regardless of other differences. People like Chuck Michel, a spokesman for the California Rifle and Pistol Association and a lawyer for the National Rifle Association, understand that. In an interview with the San Francisco Chronicle, he said Pink Pistols played a key role in the debate over Proposition H, a 2005 ordinance that sought to ban otherwise legal sales and ownership of firearms in San Francisco. "They have a great deal of legitimacy because they recognize they are at great odds of becoming victims because of their sexual preference ... I think people will understand that they should not be deprived of their rights," he told the paper. Prop H passed despite opposition by Pink Pistols, but the group's opposition was eventually vindicated when the Supreme Court ruled the measure an unconstitutional violation of the Second Amendment. With those kinds of victories, the group has become even more determined and galvanized. "Thirty-one states allow all qualified citizens to carry concealed weapons," group officials say in a post on the organization's website, PinkPistols.org. "In those states, homosexuals should embark on organized efforts to become comfortable with guns, learn to use them safely and carry them. 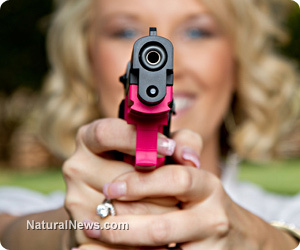 They should set up Pink Pistols task forces; sponsor shooting courses and help homosexuals get licensed to carry. And they should do it in a way that gets as much publicity as possible." Another gun-rights group that caters to gays and lesbians - GaysWithGuns.net - uses the murder of gay Wyoming youth Matthew Shepard as justification for supporting concealed carry laws. Gun Control: The notion that Matthew Shepard tied to a fence post in the middle of a freezing Wyoming night, tortured and beaten to death, is morally superior to Matthew Shepard explaining to the local sheriff how his attackers got all those bullet holes. If Matthew Shepard carried a concealed gun and had basic safety training the outcome would likely been very different. With the alarming number of Gay/LBT hate crimes owning a gun and learning how to use it right may just save a life. Maybe even YOURS! The right to self-defense is a basic human right. Indeed, the right to self-defense is a basic human right - and one enshrined in the U.S. Constitution to include all Americans, not just those who live certain lifestyles or who vote for certain political issues. And NaturalNews supports that concept 100 percent.